The Cylinder command draws a cylinder. Pick the center and radius of the base. Pick the end of the cylinder. Direction constraints restrict the direction of the circle. The center can be anywhere in 3-D space. Pick the second point anywhere using elevator mode, object snaps or other modeling aids. Draws an object perpendicular to the construction plane. Pick the center and a radius or diameter. 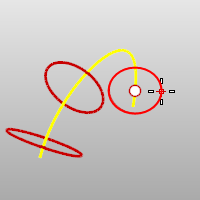 Draws a circle perpendicular to a curve. 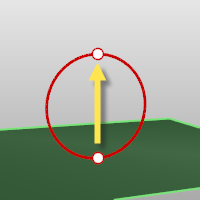 Select a curve and pick the center of the circle on the curve and a radius or diameter. Fills the base with a surface to form a closed solid.